Create a sleek and seamless look in your dining room with this dining set. The black glass top of the table is paired to black metal legs for ultra modern style that is sure to impress every guest. The black side chairs complete this dining set with a complementary dash of contemporary style. 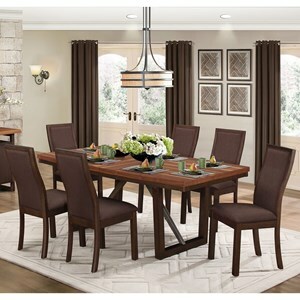 The Florian Seven Piece Contemporary Dining Set by Homelegance at Beck's Furniture in the Sacramento, Rancho Cordova, Roseville, California area. Product availability may vary. Contact us for the most current availability on this product. The Florian collection is a great option if you are looking for Contemporary furniture in the Sacramento, Rancho Cordova, Roseville, California area. Browse other items in the Florian collection from Beck's Furniture in the Sacramento, Rancho Cordova, Roseville, California area.